Is your bathroom tile showing its age, damaged or just a terrible color from decades ago? Make it look brand new again with a little help from us! Badger bath can refinish your tile and as a more practical, economical solution than demolishing your bathroom to replace it. Tile refinishing is available in a full spectrum of colors and is very durable and long lasting. We use the highest quality materials to fill any cracks or damage to your tile, eliminating grout lines. 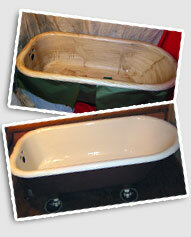 Once we refinish your tile, your tub tile will look brand new. plus, refinished tile is very low maintenance and is easy to keep clean with regular liquid cleaner. In addition to refinishing tiles, we are also able to refinsh fiberglass surrounds or install a new wall systems directly over your old tile. All tile refinishings come with a 100 percent satisfaction guarantee and warranty. Please refer to the photo gallery for pictures of this process.